What does Augusta National look like? Picture the Atlantic Ocean in the eye of a hurricane. The most peaceful and serene glass-like swells, slowly gobbling new terrain and moving effortlessly from peak to trough. Now freeze it, and paint it every shade of green you could imagine. Sprinkle in some pines, magnolias and azaleas and don’t forget to add the putting surfaces that look like the peaks of Everest. There you have it, chap. 4:45 AM: Alarm clock starts yelling. We didn’t need it, though. Our eyes were already open and they had been that way almost the whole night. We couldn’t really sleep. 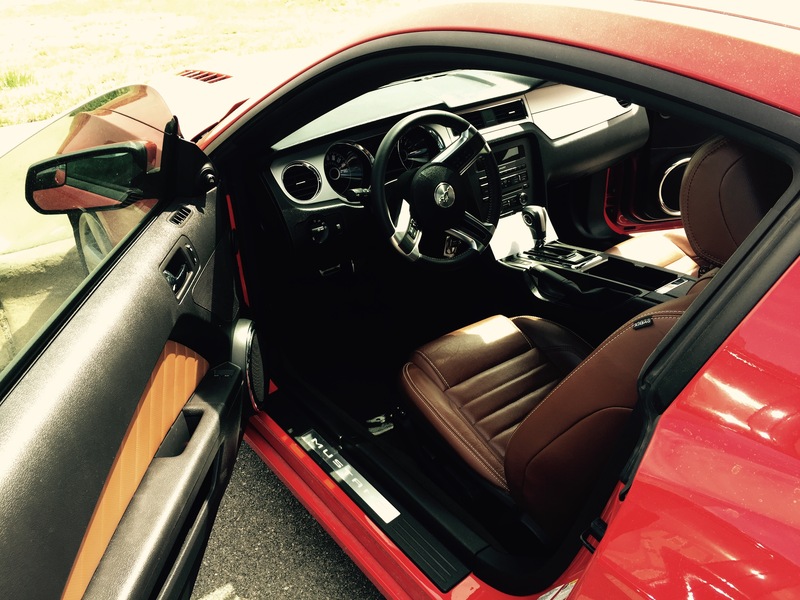 5:00 AM: Both doors sling open on the GT (A good man trusted me with his new toy for the weekend. Needless to say we got to Augusta a bit faster than we should have). I wouldn’t live long if I had this car. Four hundred and twenty horses roll over, probably waking the whole west wing of the hotel. Off to Augusta National before the big star rises. My heart feels like it’s going to explode. I’m gripping the wheel and the veins in my arms are pulsating and pushing blood to every starving artery in my body. I’ve never felt more alive. On the ramp to I-20, I hammered it. That 8-cylinder gargled like a sick school child would salt water. The wheels spun, grabbed the concrete and we both almost ended up in the backseat. What a beautiful and scary machine. 5:10 AM: We make the right turn onto Berckmans Rd. and pass this gaggle of anxious attendees lounging outside the main entrance in their armrest-less green Masters chairs. They’re sipping coffee and reading newspapers, two and a half hours before they’re allowed onto the grounds. I’d say it was comical if I weren’t one of them. Jump ahead two hours where we did nothing but sponge in local knowledge from people who have been doing this since Ben Hogan wrote that note to Clifford Roberts. 7:35 AM: At Gate 6, the first wave is off! Every soul is oddly fit as an Olympic speedwalker, disappearing through the fog faster than you can say Magnolia Lane. We inch up to the cones that border the road. In all honesty, it was all strategy. A client told me we wouldn’t get a seat on 18 unless we laid it all on the table. So, that we did. 7:45 AM: I am trucking at full steam. My legs are on fire and my calf muscles feel like they’re going to dislodge from my shin bones. Out of nowhere, I get passed by a dude who’s half my height and three times my weight with what had to be at atleast 15 chairs on his back. He looked like a dump truck doing 75 down the highway. I thought to myself, “If he’s not running, I don’t know what running is.” Regardless, no way a guard would get in between him and wherever he was going. The poor guy would have to be flown to shock trauma. 7:50 AM: Bottle neck at 1’s fairway entrance. Wave 10 crashes into Wave 9, setting off a chain reaction all the way to the front. It felt like a Megadeath concert. So, we find out they’re not letting us on the course yet. Some lady whines, “It never used to be this way! 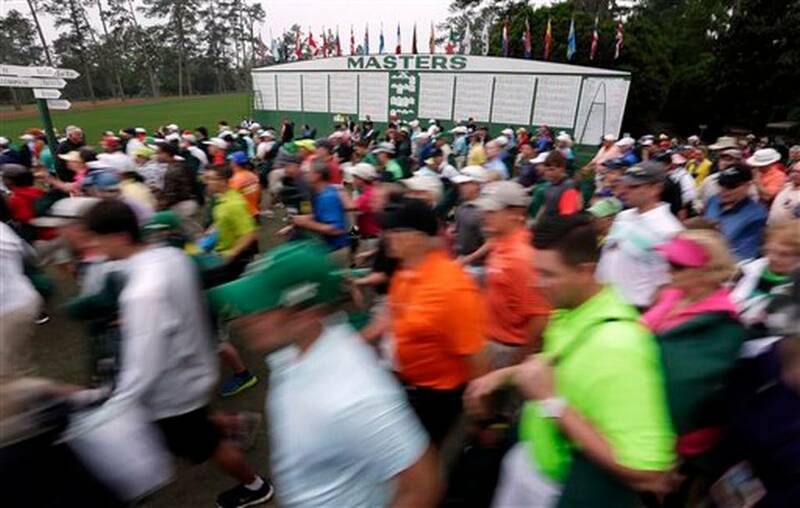 What’s wrong with the Masters this year? !” A guy in a black suit and dark sunglasses appeared next to her and all of a sudden they both were gone. (*First satirical comment, but I don’t doubt it’s happened) I’m on my tip toes, and from what I can see, maintenance is still trimming the bunker edges with their hand-held shears. Everyone’s enraged on the inside, but not really showing it on the outside. You’re at Augusta National for crying out loud. AND you survived the first leg of the Masters Derby. Time to take a breather and count your blessings. 8:00-8:29 AM – Strategic planning for the second leg. 8:30 AM: They open the string and let the horses rumble. For me, it’s a mad dash for 18. Some head for 12, some for 16. There’s a guard up front leading the pack with outstretched arms and a couple batons, reminding me of the pace car at a Nascar event. Was this Daytona or the Masters? More guards were stationed on the sides, yelling, ‘NO RUNNING” at anyone operating at more than a trot. I imagined Feherty calling the whole thing live from Butler Cabin and gave myself a good chuckle. I wonder what he would’ve said about my friend, the giant. Not exactly ours, but close. You place your business card in the back slot and nobody will touch it, remove it, or sit in it. If they do, they’ll be escorted out. 9:15 AM: Arrive at Berckmans Place – Augusta Hospitality. The first person we see is Billy Payne. He’s snapping pictures of the place on his digital camera. The scene was unreal. Berckmans has five restaurants, all boasting unlimited food / drinks and exceptional southern cuisine. Outside of the restaurants are four large putting greens, three of which are replicas of actual holes out there (7, 14, and 16). They cut the pins to match the on-course location, and let you have a rip at it. 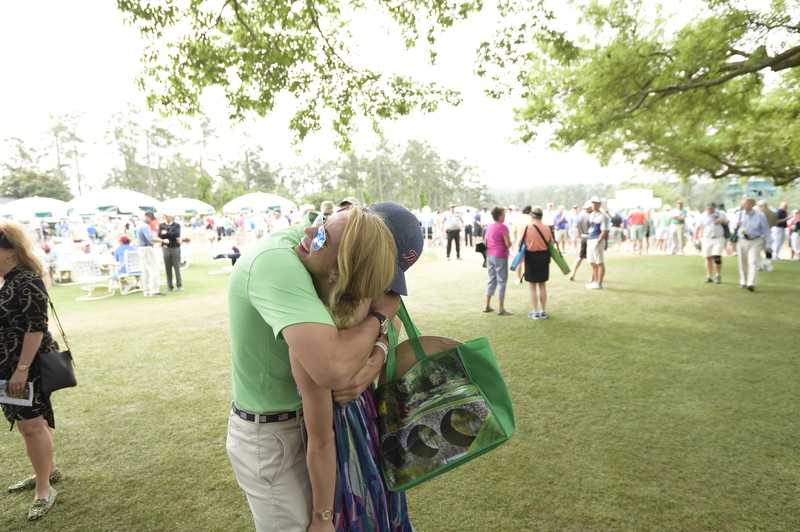 You get a real Augusta National caddie. And if you don’t listen to him, you’ll run the ball into another county. A lady in our foursome canned one from the spot Mickelson did just 20 hours earlier. The whole place went nuts. 9:45 AM – We grabbed a Bloody Mary and learned from the bartender that the venue is only open seven days out of the entire year. The rest of the time, it’s boarded up. Walking with our drinks, we made our way through the main building to find the merchandise shop. Inside, there’s exclusive gear available only to Augusta National members. We loaded up on Peter Millar and Smathers & Branson. 10:15 AM: Restroom Experience. I enter, take care of things, and one of the attendants follows up immediately after I’m done and wipes down the urinal by hand with a cloth. A guy in white gloves offered me some mouthwash at the exit. Where am I? 10:20 AM: Time to see some golf course. As we exit, we bump into Lynn Swann in his green jacket. Elyssa runs up and gives him a big hug. She tells him I’m a Ravens fan, and he raises his hand to fist bump me. So cool. 10:30 AM: We begin our walk to the first tee box from the rear of five green. I wanted to see some guys hit their approach shots into number one green, but E was adamant about getting up to that tee box. Why in the world? So, we hiked alongside one fairway straight up the hill and found somewhat of a perch right under the big oak behind the clubhouse. We could barely see the tops of the player’s heads because of the crowds. I suggested we move to the back of the tee. She disagreed, and I stood there puzzled. Starting to get frustrated, I had to remind myself I was at Augusta National. No frustration allowed. Plus, this was her wedding gift. I’m sweating now, and probably completely pale. What in the world did I do to get kicked out of Augusta in the first three hours? I’ve heard horror stories about this. Did I drop my match stick on the ground by accident? Did I look at a member the wrong way? I’m racing through every interaction I had since we stepped onto the property. 11:05 AM: We’re inside the ropes and heading for the clubhouse when the man stops and checks his papers. I faintly heard someone nearby say, “Mr. Nicklaus is putting on his green jacket and he’ll be out shortly.” I didn’t think anything of it at the time. In fact, I brushed it aside for whatever reason. I thought I was getting removed from the property by that country sheriff. 11:10 AM: I see a green blur emerging from the back exit of the clubhouse and sure enough…it’s the legend. There was a smile on his face as large as the Augusta National waiting list. (If there even is one?) He looks directly at me and extends his hand, “Hi Dave, Jack Nicklaus.” I gulped, reached my hand out, and introduced myself to the winningest major championship golfer that has ever lived. All time stopped. There we were, chatting it up with The Golden Bear underneath the big oak that has overlooked so many famous moments in golf history. ^my favorite thing anybody has ever said, ever. I remember photographers snapping pictures and my extremities going numb. I remember not really knowing what to do with my hands. I remember him making me feel like he’d known me for the past 25 years. And whether he felt it or not, (I can only suppose he did) he looked so happy and content to be talking with us. Mr. Nicklaus, you are the truest testament to the values of this wonderful game. I will remember your kindness and warm-heartedness forever. Due to what happened, the rest of the day was mostly a blur. We went back to Berckmans, had lunch, visited another few restaurants, bought some more merchandise, walked the course, and saw some fantastic Sunday golf. Not that the rest isn’t worth talking about (it is), but none of it hit as hard as that moment under the Oak. By 12 noon at Augusta National that Sunday, I had done nearly everything I’d ever wanted to do in life as a PGA Professional. It was absolutely magical. At the day’s close, we were able to see Jordan Spieth walk up the 18th and lay claim to the most coveted prize in all of golf. Here’s a kid four years younger than I, going home with a green jacket. He showed remarkable poise and talent, and I can’t wait to see him continue to rise on the PGA Tour. Thank you, E, for the most thoughtful gift I’ve ever been given. And thank you, Mr. O, who made our trip possible and our time at Augusta National that much more special. <----- You can read about that incredible story HERE. 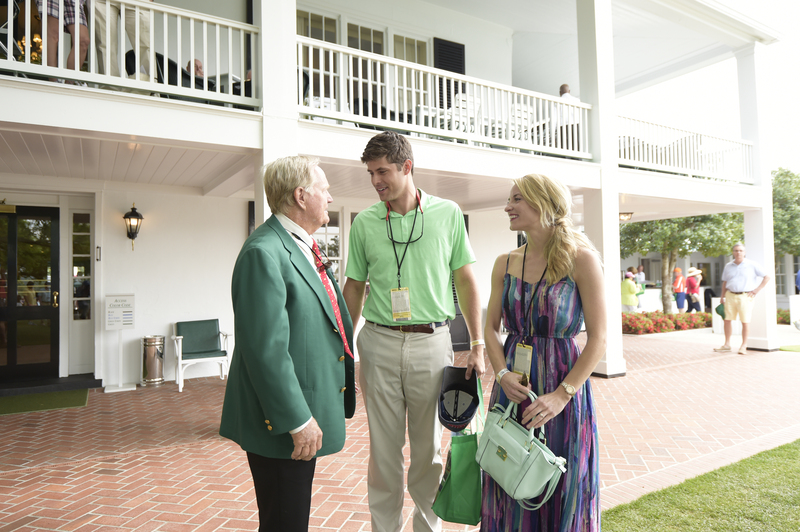 And thank you, Mr. Nicklaus, for taking the time to chat with me on Masters Sunday.